The Intertropical Convergence Zone (ITCZ), also known as the doldrums, is one of the dramatic features of Earth’s climate system. Prominent enough to be seen from space, the ITCZ appears in satellite images as a band of bright clouds around the tropics. Here, moist warm air accumulates in this atmospheric region near the equator, where the ocean and atmosphere heavily interact. Intense solar radiation and calm, warm ocean waters produce an area of high humidity, ascending air, and rainfall, which is fed by converging trade winds from the Northern and Southern Hemispheres. The convected air forms clusters of thunderstorms characteristic of the ITCZ, releasing heat before moving away from the ITCZ—toward the poles—cooling and descending in the subtropics. This circulation completes the Hadley cells of the ITCZ, which play an important role in balancing Earth’s energy budget—transporting energy between the hemispheres and away from the equator. However, the position of the ITCZ isn’t static. 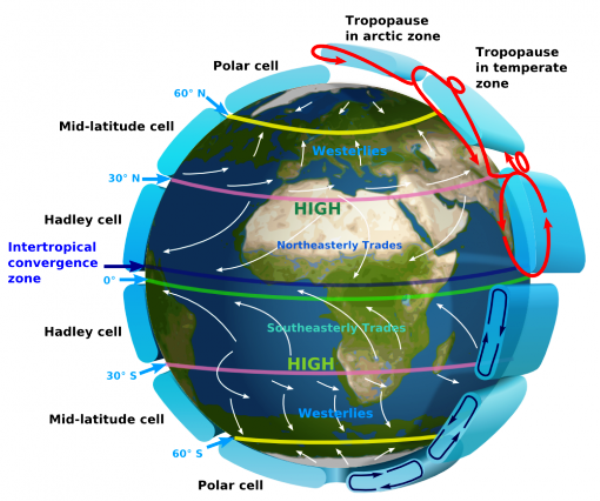 In order to transport this energy, the ITCZ and Hadley cells shift seasonally between the Northern and Southern Hemispheres, residing in the one that’s most strongly heated from the sun and radiant heat from the Earth’s surface, which on average yearly is the Northern Hemisphere. Accompanying these shifts can be prolonged periods of violent storms or severe drought, which significantly impacts human populations living in its path. Scientists are therefore keen to understand the climate controls that drive the north-south movement of the ITCZ over the seasonal cycle, as well as on inter-annual to decadal timescales in Earth’s paleoclimatology up through today. Researchers have traditionally approached this issue from the perspective of the atmosphere’s behavior and understanding rainfall, but anecdotal evidence from models with a dynamic ocean has suggested that the ocean’s sensitivity to climate changes could affect the ITCZ’s response. Now, a study from MIT graduate student Brian Green and the Cecil and Ida Green Professor of Oceanography John Marshall from the Program in Atmospheres, Oceans and Climate in MIT’s Department of Earth, Atmospheric and Planetary Sciences (EAPS) published in the American Meteorological Society’s Journal of Climate, investigates the role that the ocean plays in modulating the ITCZ’s position and appreciates its sensitivity when the Northern Hemisphere is heated. In so doing, the work gives climate scientists a better understanding of what causes changes to tropical rainfall. To examine this, Green and Marshall performed experiments in a global climate model with a coupled atmosphere and ocean, and observed how the ocean circulation’s cross-equatorial energy transport and its associated surface energy fluxes affected the ITCZ’s response when they imposed an inter-hemispheric heating contrast. Using a simplified model that omitted landmasses, clouds, and monsoon dynamics, while keeping a fully circulating atmosphere that interacts with radiation highlighted the ocean’s effect while minimized other confounding variables that could mask the results. The addition of north-south ocean ridges, creating a large and small basin, mimicked the behavior of the Earth’s Atlantic’s meridional overturning circulation and the Pacific Ocean. Green and Marshall then ran the asymmetrically heated planet simulations in two ocean configurations and compared the ITCZ responses. The first used a stationary “slab ocean,” where the thermal properties were specified so that it mimicked the fully coupled model before perturbation, but was unable to respond to the heating. The second incorporated a dynamic ocean circulation. By forcing the models identically, they could quantify the ocean circulation’s impact on the ITCZ. In the dynamic ocean model, they found that when they heat the simulated ocean-covered planet, eddies export some heat into the tropical atmosphere from the extra-tropics, which causes the Hadley cells to respond—the Northern Hemisphere cell to weaken and the Southern Hemisphere cell to strengthen. This transports heat southward through the atmosphere. Concurrently, the ITCZ shifts northward; associated with this are changes in the trade winds—the surface branch of the Hadley cells—and the surface wind stress near the equator. The surface ocean feels this change in winds, which energizes an anomalous ocean circulation and moves water mass southwards across the equator in both hemispheres, carrying heat with it. Once this surface water reaches the extra-tropics, the ocean pumps it downwards where it returns northward across the equator, cooler and at depth. This temperature contrast between the warm surface cross-equatorial flow and the cooler deeper return flow sets the heat transported by the ocean circulation. “In the slab ocean case, only the atmosphere can move heat across the equator; whereas in our fully coupled case, we see that the ocean is the most strongly compensating component of the system, transporting the majority of the forcing across the equator.” Green says. “So from the atmosphere’s perspective, it doesn’t even feel the full effect of that heating that we’re imposing. And as a result, it has to transport less heat across the equator and shift the ITCZ less.” Green adds that the response of the large basin ocean circulation broadly mimics the Indian Ocean’s yearly average circulation. Green and Marshall are currently expanding upon this work. With the help of David McGee, the Kerr-Mcgee Career Development Assistant Professor in EAPS, and postdoc Eduardo Moreno-Chamarro, the pair are applying this to the paleoclimate record during Heimrich events, when the Earth experiences strong cooling, looking for ITCZ shifts.